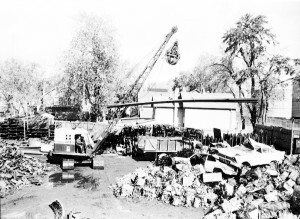 In 1927, Hyman Rosen and Norman Pollitt partnered up to found the Rosen and Pollitt Wrecking Company. The Kingston City Directory locates the business at this site, 140 Rideau Street, under the rubric “Junk Dealers.” By the time of the 1947 fire insurance plan, the stone building at 138 Rideau Street was occupied by “Auto Wreckers”, while the old brick warehouse was occupied by “H. Rosen Coal Supply”. 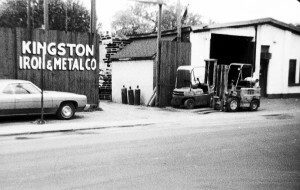 In its yard, at 140 Rideau Street, was Rosen’s “Kingston Scrap Iron Metal Co.” The site’s proximity to the waterfront via an extension of North Street was an asset for shipping. The old industrial buildings survived into the 1970s. Born in Svadest, Lithuania, in 1895, Hyman Rosen arrived in Kingston around 1911, joining his brother Meyer, an auto wrecker. Before starting his own scrap business, Hyman cut stone as a road worker, helping to create the swathe of a highway that links Kingston and Barriefield. 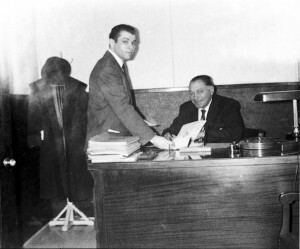 Hyman’s sons Irving and Harry built on their father’s foundations, the former expanding the scrap enterprise into a major concern, and the latter doing the same for the family’s fuel business.